Sen. Sharon Hewitt, R-Slidell, told a Board of Regents committee that she favors consolidating the state’s four college management boards. -Senator Sharon Hewitt said Wednesday that she is considering proposing legislation to consolidate the state’s four college management boards into a single board. 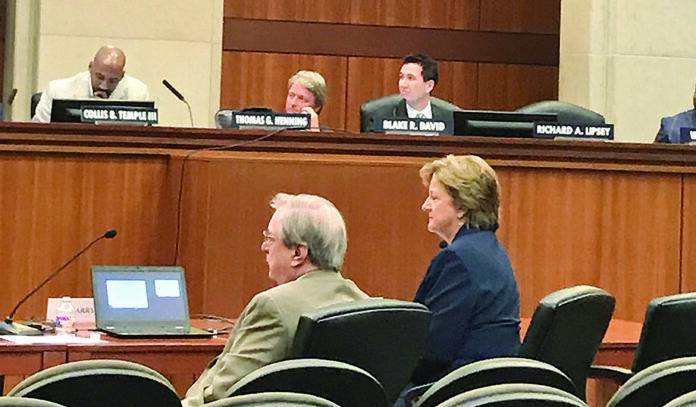 Hewitt, R-Slidell, appeared before the Louisiana Board of Regents’ Planning, Research, and Performance Committee on Wednesday. A law that Hewitt sponsored in 2016 required the board to conduct a comprehensive review of the state’s post-secondary education system and make recommendations to optimize it. As Louisiana faces a billion-dollar budget shortfall, Hewitt is leading an effort to eliminate dedicated funding designations that lock up how much of the state’s money is spent. As a result, most budget cuts fall heavily on higher education and medical care for the poor. Hewitt said it is the annual job of the Legislature to set spending priorities, so the institutions that now receive dedicated funding also should have to appear and make their cases with results and data. Louisiana’s budget has about $4 billion in dedicated funding out of a $10 billion total budget, and Hewitt would like to free about $850 million from those dedications. As of Wednesday, only two of the four systems, the University of Louisiana System and Louisiana Career and Technical College System had submitted reports on how they could optimize their spending. The Board is still waiting for reports from the LSU and Southern University Systems. In the two reports so far, Hewitt said she noticed spending inefficiencies. Hewitt said the Louisiana Career and Technical College System was the most streamlined and efficient. The system has consolidated from 42 institutions to 15 over the years. Stephen Smith, that system’s representative on the Board of Regents, expressed frustration to Hewitt, saying, “We made decisions to consolidate but where is our reward?” He said it still faces the same funding issues as the other three college systems. Board of Regents member Marty Chabert suggested that a consolidated management board may not be the final answer. Currently, all the Board of Regents can do is allocate state funding to the four college systems and then make recommendations to management boards. Jim Henderson, University of Louisiana System president and chief executive, agreed with Chabert. “Structures in higher education are often changed with minimal results,” he said. Technology is making centralization occur naturally, Henderson said. He added that It is helping his system serve its highest enrollment in five years with $300 million less in funding than it had eight years ago.